As a multicultural and cosmopolitan city, Toronto is benefiting from its growing population with an endless number of great food options. With all this overwhelming choice, there's now a community of foodies who are sharing their palate-pleasing finds of the city, providing more than just restaurant reviews, but also trying new products, attending events and launches and sharing recipes from their kitchens. Here's a list of Toronto's best food bloggers who combine writing style, honesty, frequency of posts and endless photographs with distinct site design, traffic and social media engagement to offer opinions on Toronto's food culture. Check the updated 2016 list here. This passionate foodie combines her smarts as a registered dietitian with her love for featuring recipes, reviews, nutrition tips and highlights from food events in Toronto. Written by stylish Abbey Sharpe, Abbey's Kitchen features restaurant and product reviews which are peppered with personal experience: her style of writing and approach to her readers is a chatty bubbly pal, eager to share what's new and what she's just discovered. Before the days when blogging was mainstream, I was always the go to girl among friends and colleagues for any restaurant recommendations and recipe inspiration. One day, a colleague suggested I start a blog to keep all the information on record. I actually didn't even know what a blog was but I went home that night and started writing! My ultimate goal then and now is to get people excited about great food and celebrate the world's hardworking food entrepreneurs! Blog posts are complemented with numerous photos, HD videos and plenty of hard facts, but more like an FYI and not in a professorial tone. If she looks familiar, its because Ms. Sharpe is showing up on TV with appearances on The Marilyn Denis Show. With archives featuring six years of the blog's history, categories are easy to search for past posts. Grace's mantra is "sleep 'til you're hungry, eat 'til you're sleepy." This young woman keeps it simple with her blog. She shares numerous macro photos of Toronto cuisine with minimal text which gets to the point—did she like what she ate? But she's not short on opinion. Her frequent posts of the well-known and the lesser known are a welcome view of the city's restaurants, especially for those who want to know quickly if it's worth a reservation or a drive to the 905. And don't think she just explores below Bloor Street—this blogger showcases restaurants in the suburbs too. Grace is very active on several social media channels. Make sure to check out Grace's Instagram account, just be sure to eat first. 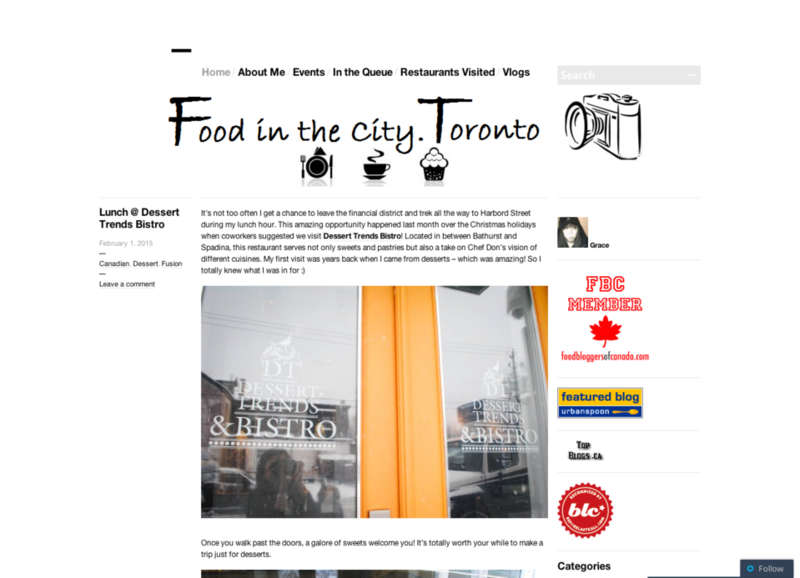 Blogging since 2010, Deb's view of Toronto foodie culture is shown through numerous vibrant photos paired with detailed descriptions. Her view is to go in-depth with her food passions such as macarons, afternoon tea, farmers markets, ramen, brunch and a very deep love for cupcakes, with several posts dedicated to the city's bakeries who showcase the wee circular cake. Her old school view of blogging is "more is more", sticking with what is now considered traditional with lengthy text interspersed between photos. For those who enjoy a story similar to reading a magazine article, it's pure foodie gold to indulge in a post, like a recent piece about foodie murder mysteries. Encouraged by his friends, Hubert Leung has been writing and reviewing menus, new restaurants and new food products since 2009. 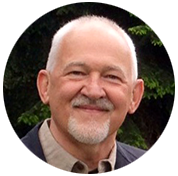 Hubert is focused on showcasing the food and adding in his own off the cuff comments and detailed descriptions. Hubert's blog posts are not about lofty adjectives and high brow prose—his everyman blog is all about that guy everyone asks hey, where should I go to eat? He also reveals his varied tastes. Hubert is just as happy to be eating fast food as fine dining cuisine. And for those who like to know about new products, this blog regularly features those soon coming to a grocery store near you. 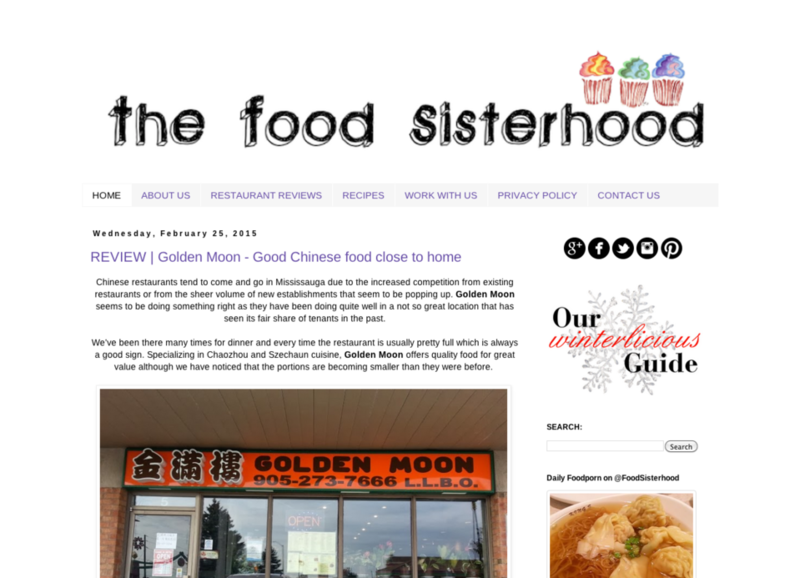 The Food Sisterhood blog was launched in 2012 by friends Clara and Monica, united by their passion for food. 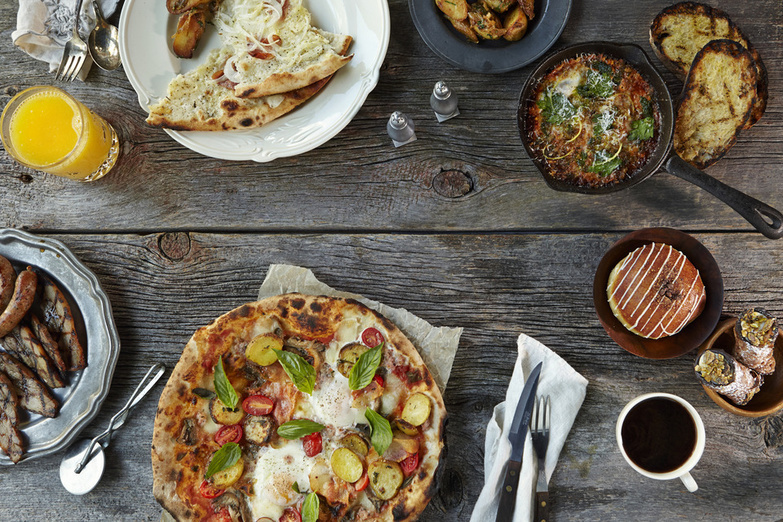 For first timers, start with the popular section to see the range of restaurant reviews and recipes, and the site can be easily searched if your palate is craving a particular kind of cuisine whether in the boundaries of the city of Toronto or in nearby suburbs and cities. And what is their favourite food place in Toronto? There's so much that goes into each dining experience and it's really hard to pinpoint that one place that has everything you're looking for in terms of quality of food, atmosphere and service. Bar Isabel is one of the places we really like because their dishes are so unique! The simple design is peppered with photos, focusing on detailed captions and minimal text. With their growing popularity, the sisters expanded their family to five other foodie sisters and more tasty images possibly inspiring hunger pangs can be found via their popular Instagram with almost 6,000 foodie followers. Blogger Sandi doesn't limit herself—her blog includes restaurant reviews divided by Toronto's suburbs and nearby cities, and includes information from her trips to Canada, America, and Asia. The blog is neat and well arranged, and you can easily find everything through the tabs, lists and search buttons whether it's restaurant or food event reviews or even commentary on a restaurant's food delivery services. Her frequent posts are conversational and her reviews, many from budget-friendly dining establishments, feature her own rating system. Sandi shares food news and photos from her regular dining events via her tweets too. 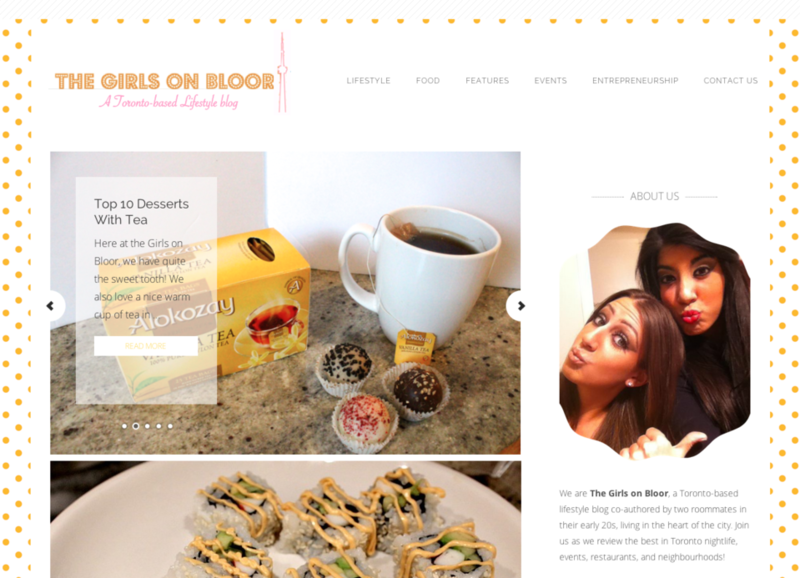 The Girls on Bloor is a Toronto-based lifestyle blog, and the girls feature many posts on Toronto's restaurants, food and recipes. 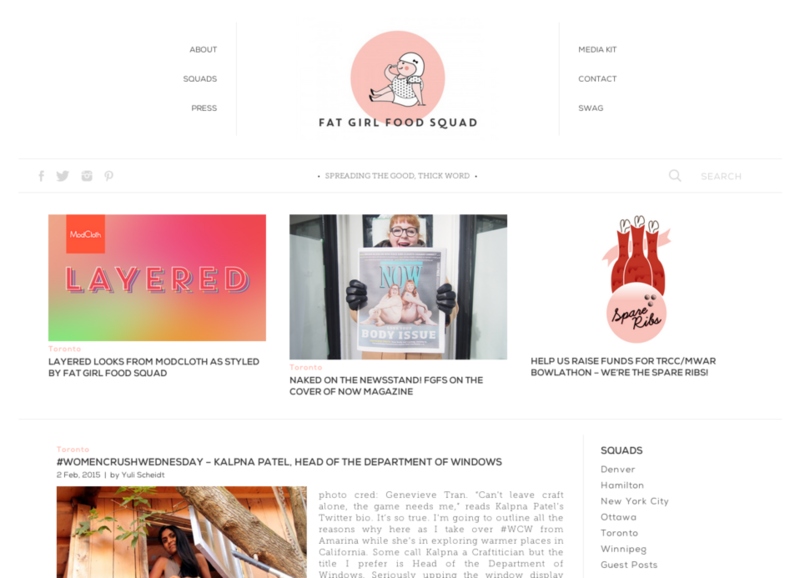 Co-founder and editor Taylor Stinson is a 20-something gal and, along with her contributors, aims to offer a website which appeals to young women who want to know about what's cool, tasty and trendy in the big city. Need to know what kind of dessert goes with which tea, where to go for a fancy dinner, or which recipe is a good one for a lazy weekend at home? This blog offers all these answers as well as tips for cocktails and where to find the fun nightlife, written for those girls wanting a tip from their new BFF. Funny, bold and celebrating women, this foodie blog focuses on "spreading the good thick word." Their view of the world is about enjoying great food, showcasing fabulous women in the food industry and encouraging a positive body image among women. This space means the world to us, and we’re very happy to have such wonderful people to share it with and help it grow. 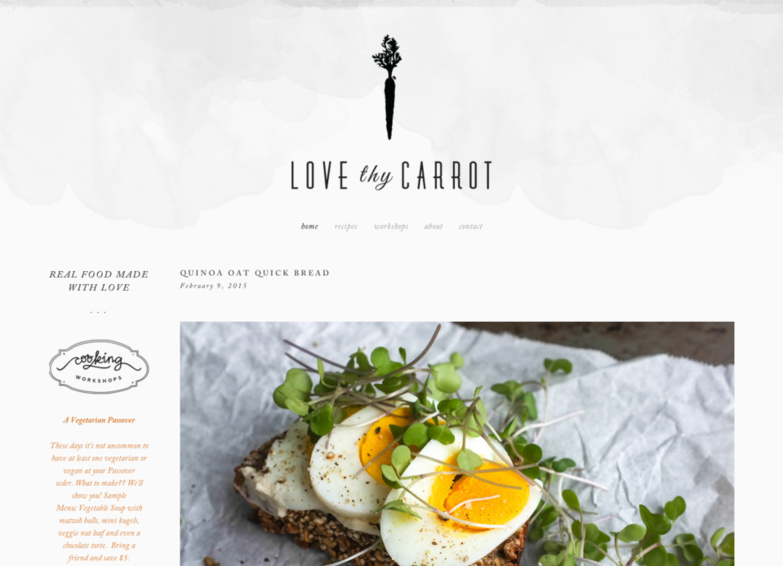 We are constantly humbled and awed at how quickly this has grown from a simple food blog to a thriving community, and we can only hope that it will continue to get bigger and better. Their regular columns like #WomanCrushWednesday and Looking Good Girl are addictive, while their Meatless Monday column offers tasty options to choose vegetarian or vegan cooking with tasty and easy to make recipes. Restaurant reviews are very detailed descriptions of cuisine, service and atmosphere. One place that stands out for me is Lee Garden on Spadina Ave. Why? Because trends come and go but Lee Garden has been serving me for over 35 years with steaming plates of Cantonese Chow Mein, Fresh Lobster and Fukien Rice. This is family food, shared with family and made with love. Stella, the author of this food blog, calls herself a food junkie: she's intense about her love for food and how she thinks about food 24/7. 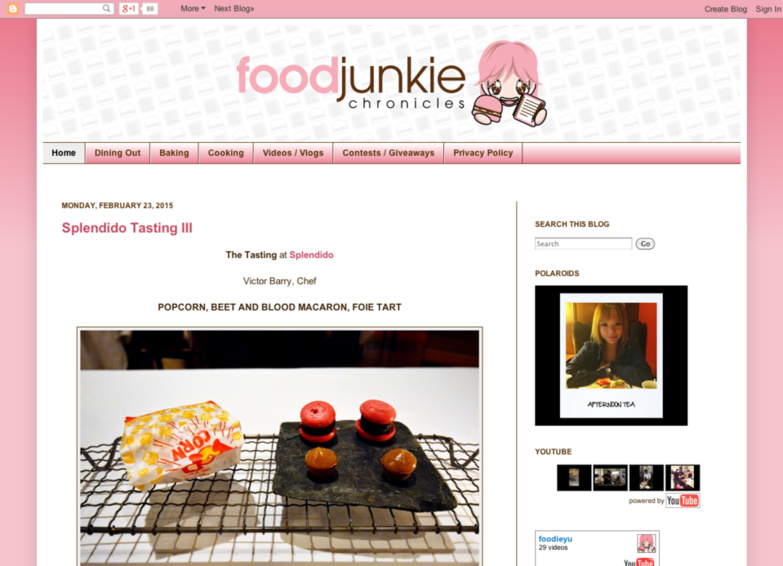 Her regular posts about food events, competitions and restaurant reviews feature plenty of photos and informative text. Stella also includes many food events that are socially-minded—a nice inclusion for readers who are interested in the food industry and its impact on community. 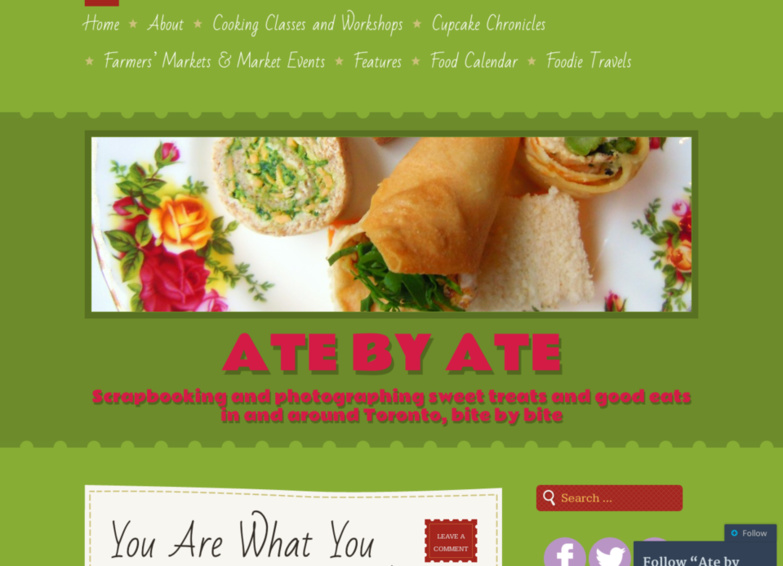 It's easy to search for recipes on her site, whether it's cooking or baking. If you found yourself on this list, congratulations! You are here for a reason you're a great food blogger and your blog is worth mentioning. Don't forget to grab one of our nice doughnut badges. They come in two sizes. Keep up the great work! My cousin Debi Traub writes thegardenofeatin. I think her photos of food and her humour are fantastic. My synagogue just published our second cookbook called Generation to Generation (10th anniversary edition) and used photos from her blog for our indexes and cover. Please check her blog out, I think you will enjoy it. Thank you very much for your tip, Donna. I’ll check her blog out. Enjoy the rest of your day. 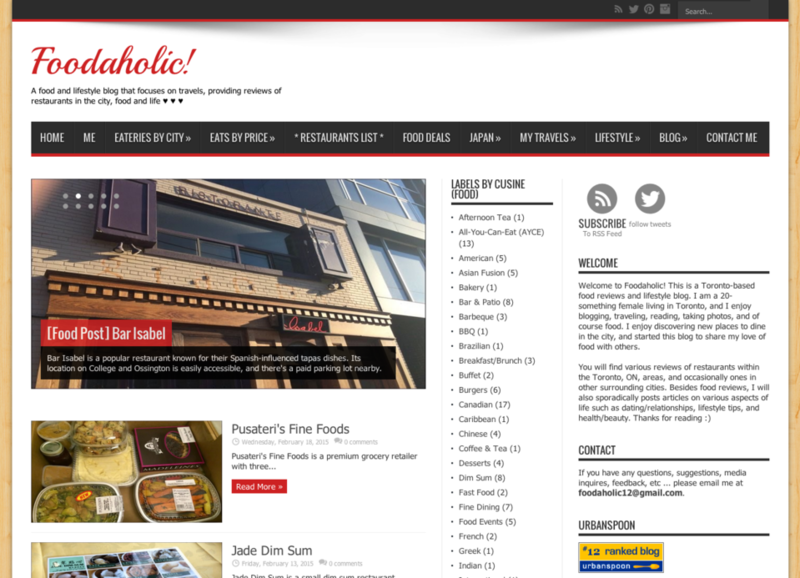 Check out wherejessate.com – she has great reviews and photos! Great list and a great post, thanks for sharing! 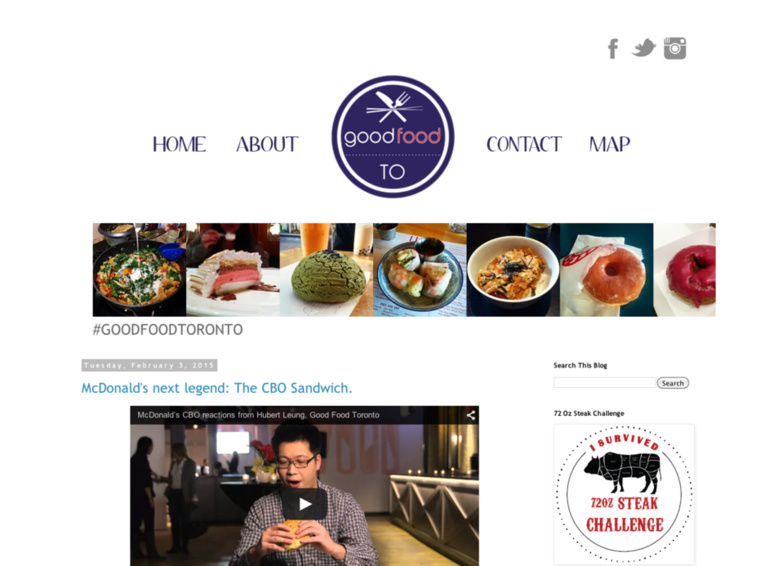 Finally some great list of Toronto’s own food bloggers! Great idea, Jamie! I’ve really hoped to see some of my favourites in this kind of a post, so, I’m happy. 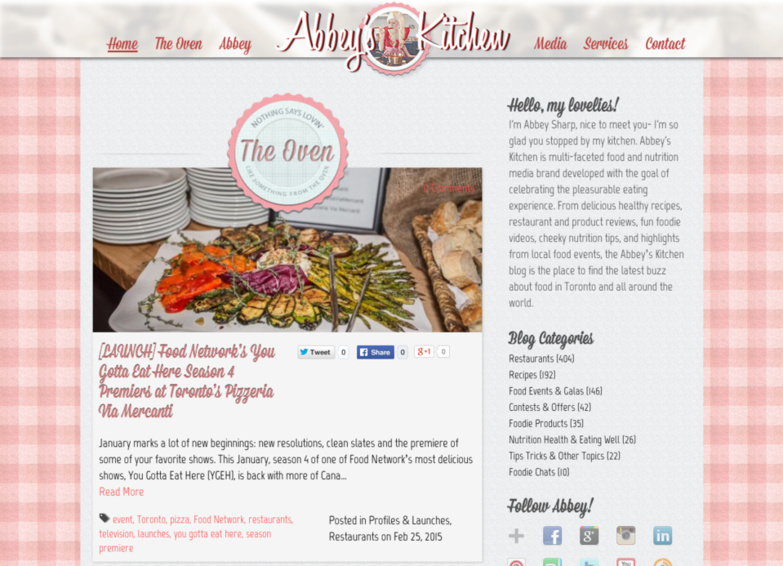 I really love Abbey’s Kitchen and followed her for a long time, so it’s nice you’ve noticed her too. Great list! Looking forward to checking these out, since I’m in Toronto, too. wwow..finally a list of food blogs in toronto…I’d spend days to look for something like this back in 2014. So many great bloggers! 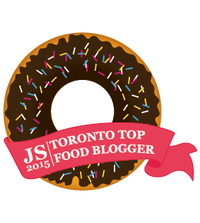 But how can you have a best of Toronto food bloggers list without Chocolates & Chai??? Easy answer: Riz was launching his website at the same time when this post was published. Hence, we didn’t know about his wonderful blog yet. Anyway, you’re right, his Chocolates & Chai blog is great. 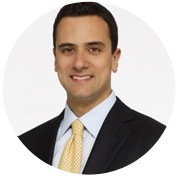 This is Riz from Chocolates & Chai… happened upon your comments this morning. Just wanted to leave a quick comment to say thank you for your lovely words! OMG! Yes! +1 for Chocolates&Chai! Thank you for all your tips. Awesome! I just stumbled upon this blog. Love it. Keep up the great work. ALways love being a foodie and thanks for the list. waiting for the weekend to view them all. Bookmarked your article. Thanks again! We have a Facebook page if you’d like to have more infos. Opened from Wednesday to Saturday evening time. We’ll be happy to come visit the place and tell us what you think. Jamie, I’m going to check these out. Like to see what the Canadian bloggers are doing! I just posted a French Canadian recipe today, tourtiere. It’s been too long since my last visit to Ontario — love it — I’m way overdue! Great list of blogs I checked them all out and they all had very impressive recipes. Great post. Best Indian Vegetarian cuisine & sweets restaurants in Toronto I found is Rajdhni sweets. Every one must try this.